Luxury holiday home, conveniently located between the famous winter sports towns of Kitzbühel and Kirchberg. 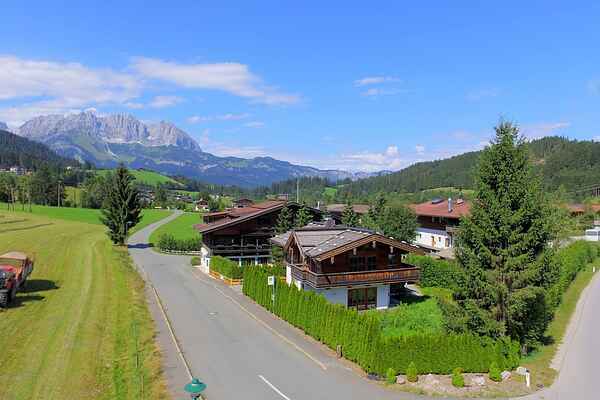 The house sits in a magnificent, sunny location, near the woods in the idyllic hamlet Reith bei Kitzbühel, just 5 minutes by car from the centre of Kitzbühel and Kirchberg. In the winter, the skibus drives to the famous KitzSki skiing area around the corner, and in the summer, numerous hiking and cycling trail start in front of the door. The cosy flat is located on the ground floor of this authentic, typical Tirol-style house. You have access to your own entrance, privacy guaranteed! From the livingroom, you can step out onto the fine, south-facing terrace with adjoining, little garden. From the bedroom, you can enjoy a terrific view of the of the famous massif the 'Wilder Kaiser'. The kitchen is fully equipped and the living room offers a comfortable sofa and cable telly. You can safely park your car in the carport.